How to Put On the Ultimate Outdoor Christmas Party. How lucky are we Down Under that we get to celebrate Christmas whilst basking in the sunshine? We may not get that festive snow that is oh so synonymous with Christmas, but we do get the chance to put on a rocking outdoor party every time the festive season is around the corner. Have you planned to throw the ultimate outdoor Christmas Party this year? If so, this article is for you. Playing the role of a party host can sometimes be a stressful experience, but one that’s incredibly rewarding once you get to see the enjoyment of your guests appreciating the hard work you’ve put in. 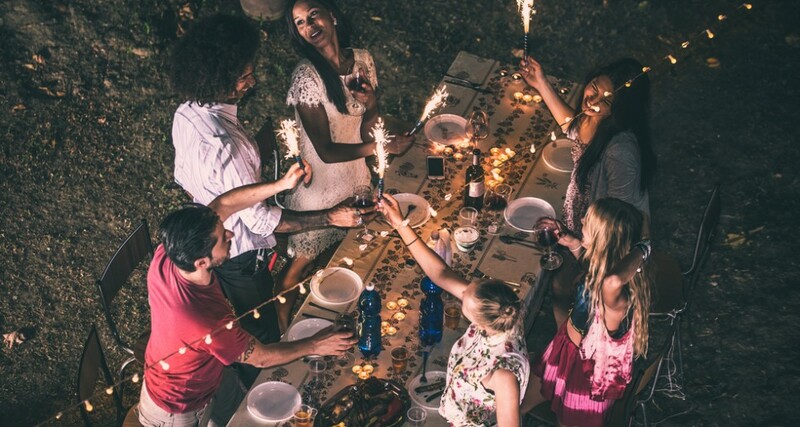 Read on to find out more about how to host the perfect outdoor Christmas Party this year. Christmas in the Sunshine can also sometimes mean that we have to ensure that our guests are kept well protected from the elements. The best way of doing so is to hire a marquee for your outdoor Christmas party. A marquee is a fantastic way to ensure that no one gets sunburnt, or that on the flipside, no one gets drenched should it decide to pour down on the day of your party. A marquee also ensures that you’ll be able to provide guests with a nice, shaded spot for them to unwind, relax and have a conversation with each other. Marquee is key! One of the best things about hosting an outdoor party is the finger food. Unlike a regular formal setup, outdoor parties give you the flexibility to be creative with your finger food menu. Why not fire up the barbecue and let guests cook their own Sausages? You could even set up a condiment station where people can get creative with their own Sausage Sizzle toppings. Always remember to provide options for various guests, and this includes ensuring you have Vegan, Vegetarian, Gluten Free and Low Sugar options on the menu. You don’t want to end up in a situation where a couple of guests are unable to eat anything, as that will dampen the Christmas spirit. All too often when planning a party, we forget about the logistics. Can you ensure that all your guests have a safe spot to park where they won’t get a parking ticket? Have you looked up the council laws on how loud you can play your music and what time things need to tame down? Looking into these things can ensure that everything goes to plan on the day of the party and that there are no unwanted surprises that crop up whilst everyone is having fun. For those who live in the metropolitan or city area, you’ll know all too well how there is often less space than you would ideally like in your home to host a party. However, that doesn’t mean all is lost, it just means that you need to make the most of the space that you already have. Think about how you can create extra space by moving furniture for the day, shifting potted plants out of the way and adding a little extra seating in accordance with the number of people you’re looking to invite. People will definitely appreciate the efforts you have made. And there you have it! Some top tips when it comes to planning the ultimate outdoor Christmas Party. Need some advice on setting up a marquee at your Christmas get together this year? Do not hesitate to contact us at 1300 934 414 today!